Patrickswell Brownes: In the beginning . . .
Every family history begins with a story. My memories of the stories came from listening to my great aunts talk about their parents and grandparents at family gatherings. I remember them saying that the Browns definitely came from County Limerick. There were also vague references to a letter that had been written to my mother by a more distant family member, David Brown. I never saw the letter until shortly before my mother died in 1996. And, like so many of us, once I had seen the letter, I never had the chance to talk about the information contained in it with the older generations. The letter itself 1, dated in 1943, is 16 pages long and includes ten pages of narrative and six charts. It starts with a listing of Brown families identified in O’Harts Irish Pedigrees 2. (See a copy of the first part of the letter on the left.) Mr. Brown then goes on to describe the information he had gathered over what is probably many, many years of research. He identified what he thought was the time frame when the family emigrated from Ireland and the names of those emigrating - Hannah Brown and her children, Patrick, Mary, John, Johanna, James and Thomas. David did have the advantage of being able to talk to children of the original immigrants, and as such, was able to give pretty detailed information on each family member. 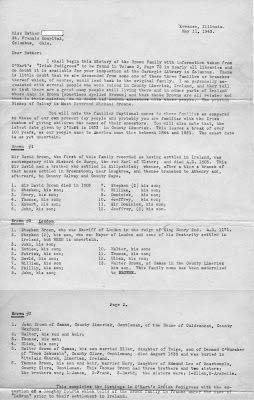 He was not, however, able to identify a specific location in County Limerick where the family originated. And, he seemed desperate to uncover the name of the husband and father of the immigrants. I believe that everyone needs to be remembered. And so, sometime in the early 2000s, I decided to try to uncover the Brown story. At that time, there was little information on the internet or in libraries, and even less about Irish genealogy, so progress was very slow to say nothing of my naivety about doing genealogical research. Since then, particularly in the last few years, extensive information, at least for Ireland, has become available. 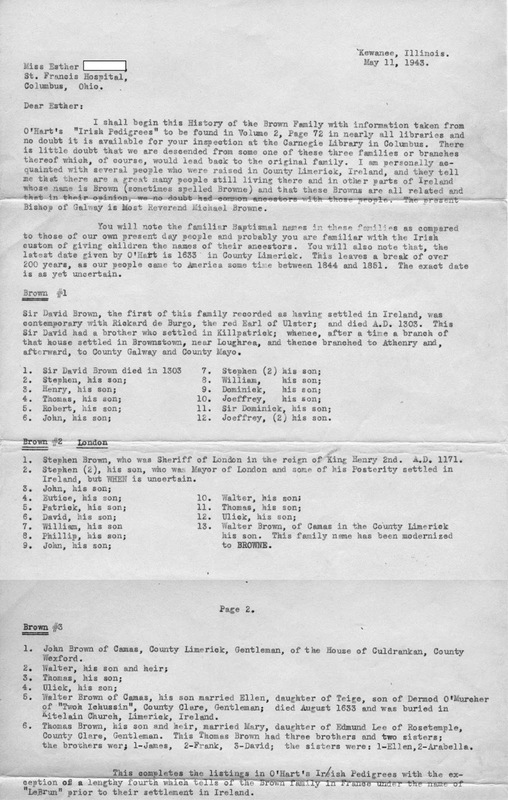 Using the letter as an inspiration and road map, I have been able to uncover a large amount of information on the Brown family, and, continue to do so. To ensure the information is not lost, and to share the information with other researchers, I will document my research and findings in this blog. It is an ongoing project. I will include clips of the letter where appropriate and information uncovered as a result of the research. And, of course, I welcome comments, corrections and any additional information others have uncovered. So, in the beginning . . .
2. O’Hart, John, Irish Pedigrees; or The Origin and Stem of The Irish Nation (Dublin, Ireland, James Duffy and Co., Limited, 1892), Volume II, 72-77, Digitized by Internet Archives. Now available online at: http://archive.org/stream/irishpedigreesor02char#page/72/mode/1up.